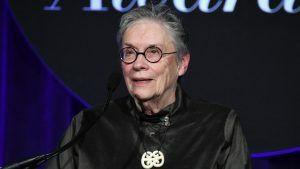 The 82-year-old author accepted the National Book Foundation’s Medal for Distinguished Contribution to American Letters with a noteworthy speech. Author Annie Proulx was awarded the Medal for Distinguished Contribution to American Letters at the 68th National Book Awards last week. Her acceptance speech can best be described as a hopeful lament; a literary salve for our fraught times. Proulx, 82, is the author of a number of books including Postcards, The Shipping News, Bird Cloud: A Memoir of Place and the short story “Brokeback Mountain,” which was made into the movie. As Proulx took the mic to accept the lifetime achievement award she noted that she had not even begun to write novels until the age of 58. Whether in the arts or in life, her message is: Get going — it may not be too late. You can watch her speech (starting at about the 40-minute mark) or read the full transcript below. I thank the National Book Award Foundation, the committees and the judges for this medal. I was surprised when I learned of it and I’m grateful and honored to receive it and to be here tonight, and I thank my editor Nan Graham, for it is her medal too. Everything is situational, seesawing between gut-response “likes” or vicious confrontations. For some this is a heady time of brilliant technological innovation that is bringing us into an exciting new world. For others it is the opening of a savagely difficult book without a happy ending. To me the most distressing circumstance of the new order is the accelerated destruction of the natural world and the dreadful belief that only the human species has the inalienable right to life and God-given permission to take anything it wants from nature, whether mountaintops, wetlands or oil. The ferocious business of stripping the earth of its flora and fauna, of drowning the land in pesticides again may have brought us to a place where no technology can save us. I personally have found an amelioration in becoming involved in citizen science projects. This is something everyone can do. Every state has marvelous projects of all kinds, from working with fish, with plants, with animals, with landscapes, with shore erosion, with water situations. Yet somehow the old discredited values and longings persist. We still have tender feelings for such outmoded notions as truth, respect for others, personal honor, justice, equitable sharing. We still hope for a happy ending. We still believe that we can save ourselves and our damaged earth — an indescribably difficult task as we discover that the web of life is far more mysteriously complex than we thought and subtly entangled with factors we cannot even recognize. But we keep on trying, because there’s nothing else to do.